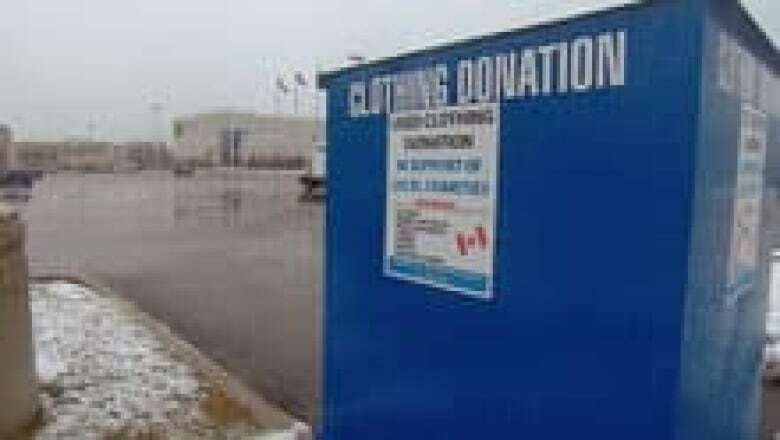 Clothes donated to charity bins are bringing in so much cash that several private companies are fighting to control the industry in Ontario. The business of collecting donated clothes, selling them in local thrift stores and shipping them overseas has become so lucrative it has created a cut-throat turf war in Ontario. One man in the industry said competition for routes in the past two to three years has become "violent." "People are getting beat up because these things work as a territory.… We have orders from the company, like don’t let competition around you," said the man, who spoke to CBC News on condition he not be identified. He said the violence has escalated since people have found out there’s lots of money involved. "And now they are fighting with each other.… people got beat up, the bins were stolen, the bins were burned out." In 2010, Canadian exports of worn clothes were valued at $174 million. Ontario's share of that market is over $132 million. Most of the clothes went to African countries, India and Pakistan. Where do you take your used clothing to donate? Take our survey. Lindsey Huculiak of Toronto was outraged when she learned that clothes she was putting in a charity bin in Mississauga where she works were likely helping to fund a very profitable private business. "This bin is here and it's leading me to believe that it is part of a charitable organization. It almost even says so on it. So when I find out that it doesn't go to charity, I’m just flabbergasted that this can happen in my community." Independent drivers are paid by collection companies to pick up the donations. The collection companies pay the drivers by the pound and in turn sell the clothes at a profit to bulk buyers, who then often resell it to for-profit thrift stores and buyers in the Third World. Charities do get some of the money but it is often a flat fee. CBC found the name of one legitimate charity run by the Ontario Provincial Police on a bin, but the OPP said it was no longer associated with the bins. 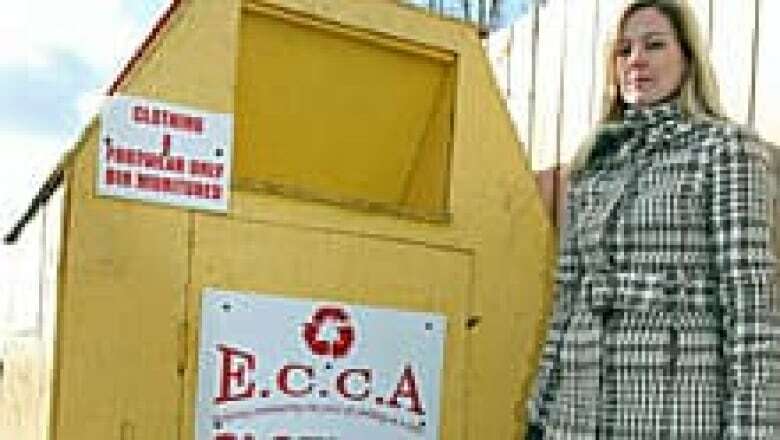 Some signs suggest the charity is getting all the money, but when the CBC called the charity named on such a bin, the charity couldn’t verify this. Other bins don't actually name a charity — but imply a connection by saying "in support of local charities." A recent court case gave the public a close-up view of some of the money being made from used clothes collected from parking lot or roadside bins. A man who owns one of the bin companies said in court that one of his route supervisors made $12,000 a week, while a driver can make $12,000 a month. The man who spoke to the CBC anonymously said that a driver can make "maybe $200,000 a year." The court case was about one competitor in the business accusing another man of pointing a gun at him. Though the man was acquitted, the ensuing trial forced one of the largest companies in the bin collection business to open its books. The judge in the case expressed surprise at the "very small portion of the revenue generated from the business being given to certain charities" while the business "produced extraordinary revenue and income for those involved." 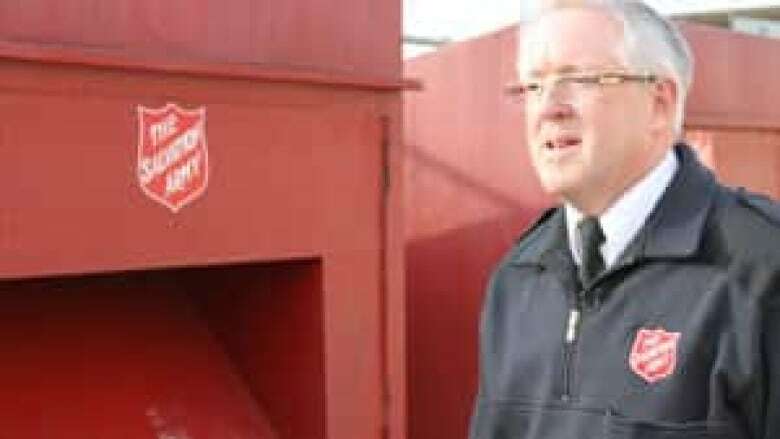 A spokesman for the Salvation Army, which collects the clothes from its own bins and returns all the profit to the Salvation Army, says their bins are a "lifeline for the donations that people provide our thrift stores." Pastor Dave Kennedy said he has seen a decline in donations in recent months in Orangeville. "There's only so many bags of clothes that a community of our size is going to generate in a given week." Kennedy was surprised when he learned of the tens of millions of dollars being made in Canada in the used-clothing business. "I'm staggered. Never, never considered that there’d be that kind of money involved in the surplus recycling of clothing. It's amazing." More than 9,000 charity shops in the U.K. sell used clothing. The shops on every high street are thriving, with profits up 12 per cent in 2010. The total profit from charity shops in the U.K. in 2010 was £153.1 million, with Oxfam recording the highest individual profit of £26.9 million. It has been reported that the Canadian government is looking at the U.K. model for allowing charities to expand how they can make money to do their good works. The private businesses have had another effect on charities like the Salvation Army, Kennedy said. His thrift store spends a significant amount of money – anywhere from $12,000 to $14,000 a year – in dumping fees to dispose of unacceptable goods, some of which come from the for-profit drivers, he said. "They will accumulate garbage on their truck that they don't want to take back to their depot, and they have made a habit of coming in and dropping it off here." Charity Intelligence will help locate charities if they are only identified by their nine-digit charitable registration number on a bin. Charities are also listed on the Canada Revenue Agency website. Bri Trypuc, head of donor services of Charity Intelligence in Toronto, said that even when you find that the name on a bin is that of a legal charity, you should still call the organization to find out what they need and what clothing they will accept. "When you give direct to an organization, chances are that organization will use the donation for good, on front-line programs, and for their clients as opposed to being shipped overseas and sold for a business benefit." Toronto's Hospital for Sick Children just announced it will be lending its name to new clothing bins. The vice-president of the SickKids Foundation, Adrian Horwood, said the bins will be clearly marked as being operated by a private company, DYN Exports Inc., and that 41 per cent of the proceeds will go to SickKids. Kennedy said that despite the bin wars, he is thankful that people are very generous. "There are a lot of good things that are happening in our community and communities like ours because people donate used clothing." If you have any information on this story, please contact investigations@cbc.ca. P.O.V. 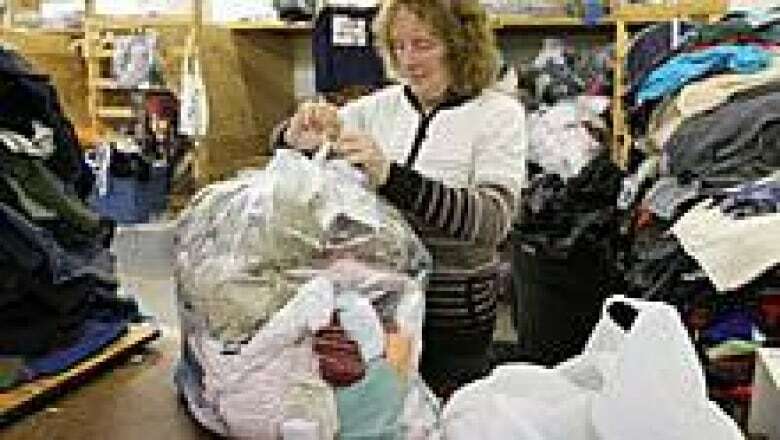 | Where do you take your used clothing to donate?